Barclays Capital released the latest forecast of gross government debt-to-GDP ratios for a number of nations. 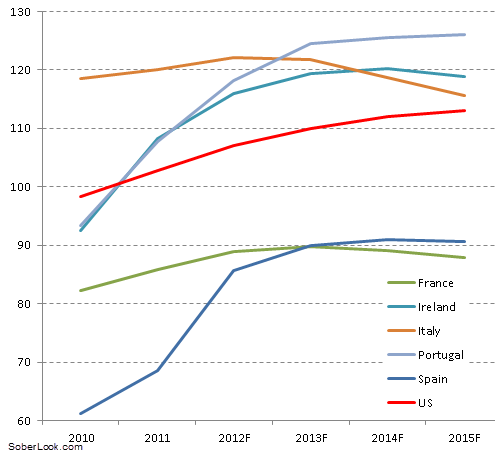 Here is how the US compares to the more leveraged countries in the Eurozone going forward. The market has instilled some discipline around the periphery nations' debt growth. There is a natural limit to how much they will be able to borrow. Not so for the US, as the world seems to have a seemingly endless appetite for US government paper (for now). And of course the Fed is always there to pick up any slack. At this rate in a few years the US debt to GDP ratio will look very much like that of the Eurozone periphery.